I reviewed the best pellet grills on the UK market for 2018 to make your choice that much easier. I have to confess that when I first started writing my website in 2006 pellet grills weren't on my radar primarily because they didn't exist here in the UK. My heart and soul comes from a charcoal background but because readers ask questions about pellet grills I find myself duty bound to answer so the mission I have chosen is to find the best pellet grills that are available on the market today. Moreover, as I've done my research and cooked on various pellet grills I've come to appreciate why you would choose to buy one and I'm actually now cooking on my favourite pellet grill all the time. How times change but when it's a warm evening after a hard days work, I want to sit outside with a cold beer while my food cooks... but the last thing I want to do is mess around lighting a fire. All I want to do is turn a knob, put in my food, close the lid and relax. It's 2018 and it's pellet grill time! You can get the same with gas I hear you cry. In my view the wood flavour of the pellet grill coupled with the simplicity of cleaning doesn't even make it a close call, I'd go pellet grill every time. 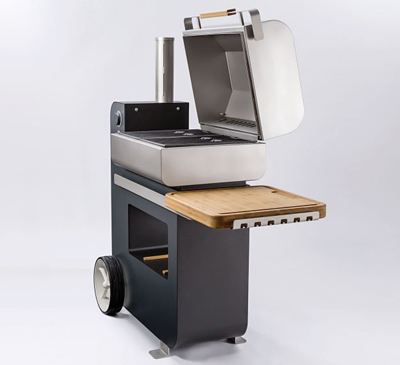 The market for pellet grills in the UK is growing exponentially, it won't necessarily wow the charcoal aficionado but if you're an ardent gas griller then be prepared for going electric next time you replace your grill. 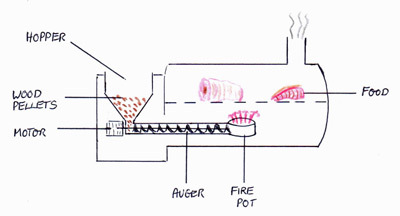 Wood pellets are fed by auger (screw thread) to a central fire pot where they are burned to create smoke and heat. Powered by electricity, a microprocessor control board regulates the burn time of the wood pellets (based on the desired food chamber temperature) and the speed of the fan which circulates the hot air around the food chamber. A baffle plate sits between the fire pot and the food to prevent burning and the fan ensures that the grill tray is surrounded by heat. The pellets are manufactured from sawdust and after a heat and pressure treatment forms a nice clean easy to use fuel. I've always considered myself a BBQ caveman in that I like the challenge of man taming the fire but then I like my gadgets too. 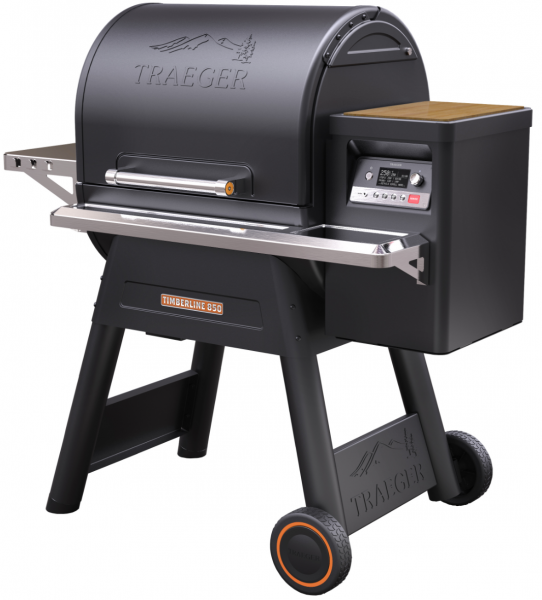 It started with the Grillson in 2014 and pretty much now all of the best pellet grills on the market have some form of Wi-Fi control to a greater or lesser extent. In fact it's pretty much an entry level requirement to the market. Most manufacturers offer an iPhone / Android app which when coupled with the temperature probe(s) provided will give you the ultimate control. You can program by type of meat, the cut and then the degree of cooking that you prefer so whether it's a safely cooked joint of pork or a medium rare steak the app alarm will tell you exactly when your meat is cooked how you like it. Right first time and every time. If you're into gadgets and clean outdoor living then it's time to invest in a pellet grill and show your neighbours why their gas grill is so last century! Cleanliness is key. The fuel source is a wood pellet that is stored in an airtight drum and scooped into the hopper on the side of the grill when it's time to cook. Note: Some even have a "self clean" function that means no work at the end of the cookout. Just like the kitchen oven. Turn the dial to the temperature you want and your pellet grill will warm up to that temperature. Lift the lid to put your food in (the temperature drops) and as soon as the lid is closed the pellet grill will ramp up to the set temperature once again. With the help of the temperature probes and the cell phone app you get perfect results every time. The best pellet grills (and most expensive) have insulated lids allowing for higher cooking temperatures. This opens up the opportunity for bread baking and pizza! It's electric, (you choose how much of your electricity supply is from renewable sources) and the wood pellets are a sustainable commodity. You don't have to burn fossil fuels and you won't run out of gas either. The title of this page "best pellet grills" is actually a bit of a misnomer. Yes these beasts are generally referred to as pellet grills but very few actually provide anything much more than a hint of direct heat (Grillson and Memphis Grills being the exception). This isn't the end of the world but it does mean that when you want those grill marks on your steak, the best way to get it (on a conventional pellet grill) is to insert and heat up a cast iron griddle pan. Note: You'll struggle to do a steak in one of the cheaper pellet grills because the single skin food chamber won't get your grill pan up to a sufficiently high temperature. Whichever pellet grill burner technology you choose there's always going to be an element of noise and injected air is force into the burner chamber. The higher the cooking temperature, the louder the noise. Some pellet grill manufacturers have developed silencers which diminish the noise element but you can't pretend that all you're going to hear is the sizzle of fat dripping on the coals. If there's a price to pay for the consistency, cleanliness and convenience of pellet grilling then this is it, but let's be clear, it's a background noise and not a pneumatic drill! Modern pellet grills have digital controls and printed circuit boards so inevitably there's more to go wrong than with a charcoal fire. When buying a pellet grill it's important to research the manufacturers warranty and after sales service. Your choice of pellet grill will have an impact on the cooking performance and the results that you achieve. The more expensive the price, the better the build quality and cooking performance therein. The hotter the temperature the cleaner the burn of the pellets and this means less smoke. Thus the amount of smoke flavour that you get in your food is inversely proportional to the heat intensity of the burner. 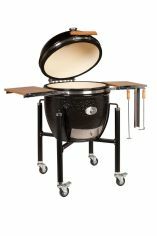 The best pellet grills will have some system of smoke enhancement for those that want extra smoke flavour. The mix of wood to bark in the pellet will be better. Adding more bark to the pellet lowers the manufacturing cost of the pellet but bark produces ash which can clog up your grill burner. Branded pellets are the right size for the grill. We've heard many stories about Traeger grill augers getting clogged up and one recurring reason is that the wood pellets being used are too long. Keeping on the subject of pellets, it's important to keep your wood pellets dry as this is the single biggest reason why folks complain that their pellet grill won't come up to temperature. It's not the performance of the pellet grill that's failing, it's damp in the pellets. Most pellet grill manufacturers offer airtight storage containers for wood pellets and they are well worth the investment. When you've finished cooking you need to burn out the remaining pellets from the hopper. Water is one of the products of combustion so un-burned pellets can get damp and so affect the performance at the next cookout. Note: This is not a problem if your grill has a self clean function as this process makes good use of any remaining pellets. Pellet grills will also appeal to those who like to make best use of today's technology. Couple all this together with wood flavour, the environmental considerations and it's easy to see why the pellet grill market is seeing significant growth. Over and above the basics it's fair to say that you get what you pay for. At the lower end of the market you'll get a single skin unit that's functional. As you move up the price spectrum you'll start to see the thermal benefits of a double skin and insulated double skin at the top of the range which in turn delivers greater cooking flexibility. New burner technologies are now well established and deliver greater cooking capability admittedly at a higher cost so to get the most out of a pellet grill you really need to be looking beyond entry level and towards the more expensive end of the pellet grill market.